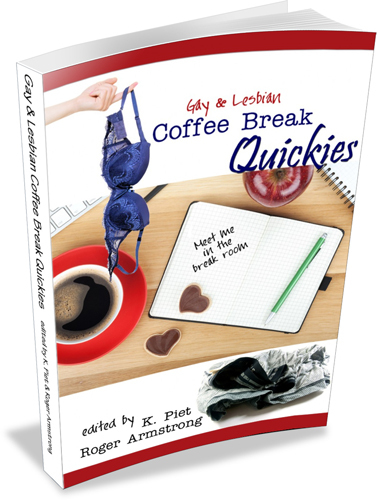 Contains “His Nonexistent Coffee Break” by Lor from Storm Moon Press. women getting it on with a co-worker or a boss in a steamy office romance. Some of them are established, and have been sneaking around the office for some time, while others are just beginning to experience the allure that can come from keeping the secret. Whatever the case, though, they’re sure to arouse your imagination, and maybe even leave you looking at your own co-workers a little bit… differently. Some of them are established and have been sneaking around the office for some time, like Lori Hunt and her P.A. Ms. Lovell in She’s the Boss or Tom and Neal in Personal Assistance. Others, like The New Guy‘s Greg and Eli or the awkwardly-named Rebecca A. and Rebecca B. from Tele-Romance are just beginning to experience the allure that can come from keeping the secret. Nor are such trysts confined to the office itself, spilling out into stairwells, copy rooms, gyms, and even computer server rooms. Whatever the case, though, they’re sure to arouse your imagination, and maybe even leave you looking at your own co-workers a little bit… differently.